By Stephane Delourme of The Seafood Restaurant, Padstow. For the potato curry, cook the potatoes in boiling salted water for 6-7 minutes until tender, then drain. Meanwhile, heat the oil in a pan, add the mustard seeds and, when they begin to pop, add the onions. Fry for 7-8 minutes or until the onions are soft and lightly browned. Add the turmeric and potatoes and some salt and pepper and fry for 1-2 minutes. Add the pieces of smoked haddock, bring back to a simmer and poach for 4 minutes. Lift out with a slotted spoon, cover and keep warm. Discard the fish poaching liquor, pour another 5cm water into the pan and bring to a very gentle simmer; the water shouuld be just trembling and there should be a few bubbles rising up from the bottom of the pan. Add the vinegar, break in the eggs and poach for 3 minutes. Lift out with a slotted spoon and drain briefly on kitchen paper. To serve, spoon the potato curry into the centre of 4 warmed plates. Skin the haddock and put on top of the potatoes. 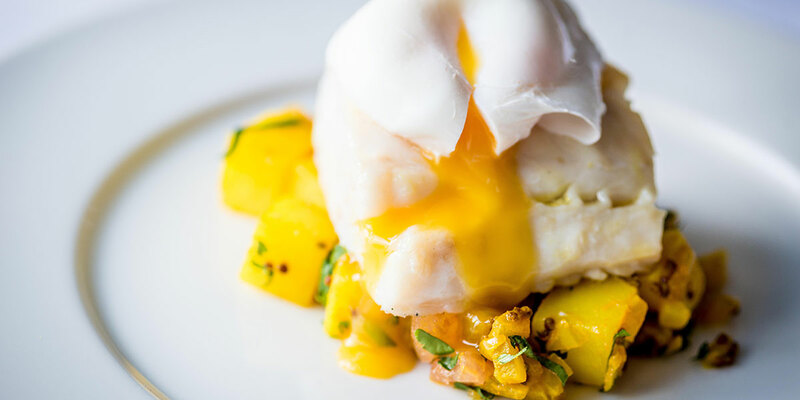 Put a poached egg on top of the fish and garnish with the sprigs of the coriander.